Happy Hanukkah from us at MVD Express! Happy Hanukkah from MVD Express! We hope you and your family are enjoying the holiday season. Hanukkah is a great time to remember the people we care about most and to visit with them while celebrating one of the most important holidays in the Jewish religion: the commemoration of the rededication of the Holy Temple in Jerusalem. The kindling of the lights. 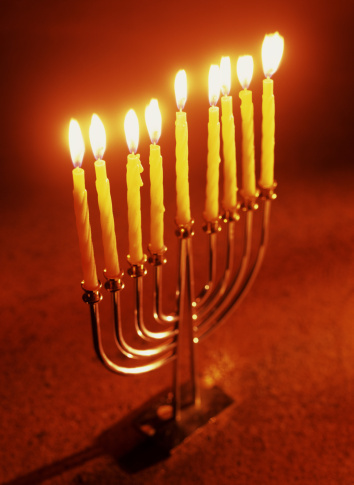 Every evening for the eight day festival, a candle is lit on the Menorah to remember the miracle of the holiday. According to tradition, the light should last for at least half an hour after it gets dark. The blessings over the candles. The three Brachah are all recited on the first night and the first two are read on the following nights. The singing of the Maoz Tzur. This hymn details the struggles of the Jewish people throughout history and praises God for helping them find ways out of their persecution. The observance of Zot Hanukkah. The last day of Yom Kippur and Hanukkah, the day is spent repenting out of love for God. These traditions reflect the reverence for the Festival of Lights. We hope you and your family enjoy the holiday! Whether you celebrate Hanukkah, Christmas or any other holiday during this season, we want you to celebrate safely! Keep your family and the people you care about safe during this time. Be aware of others on the road and drive appropriately for the road conditions that are present. Happy holidays!